You have a great relationship with your neighbour, and both of you have come to the mutual understanding that it’s now time to build a dividing fence in order to keep their new dog contained in boundaries of their property, and out of yours! But what exactly is a dividing fence, who owns it and who pays for it? Here is a guide to fencing regulations in Queensland. In terms of fencing and neighbouring properties, there are two basic types – a dividing fence and a boundary fence. A dividing fence is usually a fence that separates two privately owned properties, and the term doesn’t include a fence running along the boundary of a road (which is a boundary fence) or a retaining wall. However, it is normally constructed along the common boundary line between two properties. A dividing fence isn’t just a line of wire, panels or posts either – it’s anything that encloses an area of land, which can include a hedge, a ditch, an embankment and even a creek, and a dividing fence doesn’t have to extend along the entire boundary. Who owns a dividing fence? If a dividing fence is built on the common boundary line, then it is equally owned by both adjoining neighbours. However, a fence or part of a fence built on one neighbour’s land is actually owned by that neighbour, even if the other neighbour helped pay for the fence. So if you are paying for half the cost of a fence, you should ensure it’s actually built on the boundary line. What are the basic rules for dividing fences? There should be a ‘sufficient’ dividing fence between properties if an adjoining owner requests one, regardless of whether one or both pieces of land are empty. In terms of fencing regulations in Queensland, a ‘sufficient’ dividing fence is one that’s between 0.5 and 1.8 metres high, and is constructed of ‘prescribed material’ which includes wood, chain wire, bricks, concrete blocks or metal panels. Of course it’s also ‘sufficient’ if you and your neighbour agree that it is! If you’re still not sure, The Queensland Civil and Administrative Tribunal (QCAT) can also help you determine if a dividing fence is ‘sufficient’ or not. Who pays for the dividing fence? In terms of fencing laws in Queensland, if you are looking to build a dividing fence between you property and your neighbour’s, you need to give you neighbour what’s called a ‘notice to fence’. This is a letter that should include details about the fence, how it will be built and how much it will cost (including their half-contribution). You are required to obtain at least one quote (out of courtesy apply for two), and if your neighbour believes the quotes are too expensive, they have the right to obtain their own quotes as well. Neighbours usually contribute equally to the cost of building and maintaining a dividing fence, and if issues arise, they normally need to be solved by the owners of both properties themselves. Rental tenants who have queries over dividing fences should contact their agent or property owner. Also, if one neighbour would like more work done than is necessary in terms of the fence being ‘sufficient’, then they must pay the additional cost. So for example, if your neighbour needs a higher fence to keep their dog safely housed on their property, then they should pay the additional cost of labour and materials in order to build the fence to a height that’s outside of your own ‘sufficient’ needs. When is a dividing fence not needed? You don’t need a dividing fence if either property is public land, if both properties are classified as agricultural land, if there is no owner of the land (for example, land under the Nature Conservation Act), or if both you and your neighbour agree you don’t need one! It’s worth noting that retaining walls are not classified as fences either, as they are built to support excavated or built-up earth. They are also not normally the joint responsibility of neighbours either as they usually benefit one neighbour more than the other. Again, QCAT can help resolve fencing disputes that include work on a retaining wall, or if the repair of a fence also requires work on the retaining wall or walls. What happens if there is a dispute over a dividing fence? 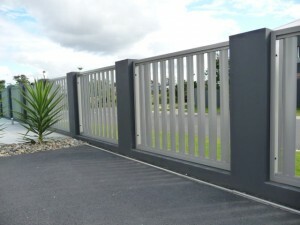 Dividing fences can often be a common cause of disputes between neighbours, because people often disagree over the type of fence needed, or who pays for both the building and the upkeep of the fence. This is particularly the case when one neighbour wants a fence for a specific purpose, for example, in order to keep a dog safely housed on the property. Legal rights concerning a fence in Queensland are covered by the Neighbourhood Disputes (Dividing Fences and Trees) Act 2011. However, wherever possible you should try and resolve any disputes directly with your neighbour. Mediation is another way of settling disputes without the need for legal action as it’s easier, cheaper and quicker than going to a court or tribunal. Assistance is available through a number of dispute resolution centres throughout Queensland. QCAT can also help resolve disputes up to value of $25,000, and they can make legally enforceable decisions on the matter. However, this should be considered as a last resort. If the issue can’t be resolved, legal advice can also be sought through the Queensland Law Society who can refer you to a private lawyer. It’s worth noting that Legal Aid Queensland doesn’t provide legal advice about fencing disputes, however they can give you contact details for your local community legal centre, including the Queensland Association of Independent Legal Services (QAILS). Specific requirements exist across Australia for pool fencing, so the laws and regulations for dividing fences don’t actually apply in this case. However, in Queensland, dividing fences can serve as pool ‘barriers’ because they are often the most efficient way to comply with the state’s pool safety laws. Check the regulations in your state for more details. You and neighbour have agreed you need a dividing fence, so what now? Contact the professionals at FenceCorp today on (07) 3715 5055. Posted in Advice, Updates. Bookmark this page. Great service! Great price! Found them prompt and easy to deal with for all my fencing needs. Would definitely refer or deal with you again. Thanks.